Morelands was formed a little before Riverdale hence the different styles. These buildings were originally designed as ‘shells’, with large, open-plan interiors. The taller buildings housed the site’s three original engines, with extensive cellar spaces below the engines. Beside each engine house was a lower boiler house and then an adjacent coal store. When Riverdale was constructed, a forge and workshop were also created to repair and maintain the pumps. Historical drawings and photographs show the original entrance arrangements and we intend to restore many of these. This will go hand in hand with conservation and repair of the brickwork and pointing and an extensive repair programme to the roofs. The slate-covered roofs are supported by original iron and steel trusses, which were highly innovative at the time. Some of these trusses are badly decayed, but they contribute greatly to the character of the interiors and we intend to retain the views of the open roof spaces within many of the interiors. To preserve the trusses we need to strengthen the roofs, ensure they are water-tight, improve the hidden gutters, etc. In doing so we will be restoring the Welsh slate finishes and repairing the glazed lanterns. We plan to replace the current unsightly steel roller shutter doors with new dark-tinted glass door panels that will sit well against the brick and introduce a consistent uniformity across the building entrances. This building has an extraordinarily fine interior, surprising for a pump house, but the engines were things of beauty too and showpieces in their day. 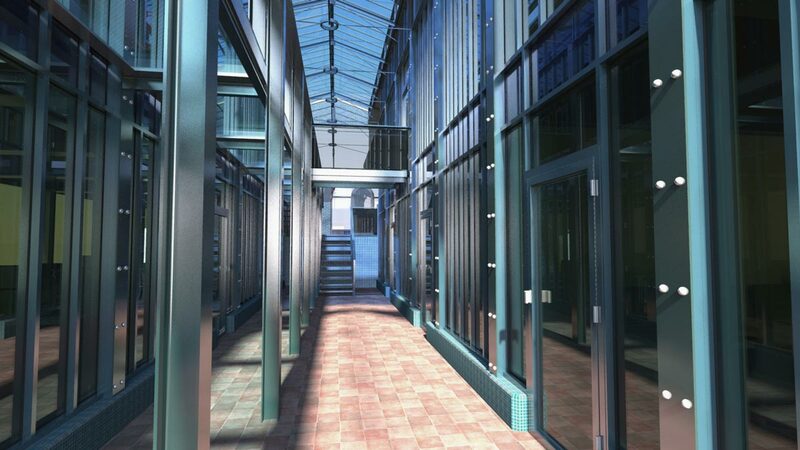 It would be a crime to interfere with these fine walls, so the new fully glazed interior structure is set-back from the walls and becomes a transparent building within a building. The new interior structure takes certain cues from the original engines, using exposed metal columns and a double staircase following the lines of the original stair up to the gantry levels. The space has been designed for the pleasure of everyone on the site. The site reception and principal universal-use meeting rooms are located within. The Arcade area is formed of three parts, originally for two boiler houses, each supporting an engine house, either side of a central coal store. The boiler houses were lit internally by large roof lanterns and the coal store had a large, arched opening. Extensive alterations to this façade will be reversed to restore the original symmetry. The interior scale and the architecture of the Arcade roof space is impressive. The intended design respects these qualities by retaining the visible open view of the restored iron roof. The west and central areas provide a double storey office range benefiting from daylight via glazed interior facades. The east area provides a large, contained lab facility. This is the earliest building on the site and once contained a ‘Cornish engine’ (which can be seen working at the Kew Bridge Steam Museum). This was the first engine to be removed from the site, very early in the 20th century and as such the building has been redundant longest from its original function. The Beam House was split into four levels and used as offices by the former owners; these modern alterations will be stripped out. 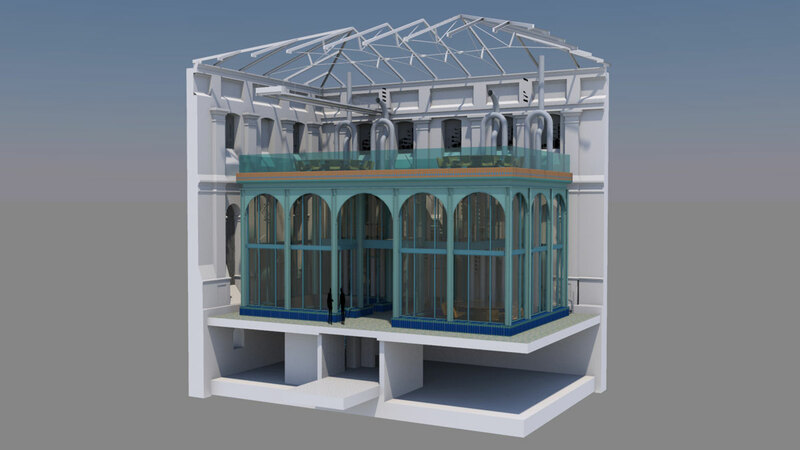 Upon a restored entrance floor level, three levels of glass-fronted offices will be created, set far back from the walls with their large windows to retain the original character of this large open engine house interior. The ‘workshop’ buildings needed large areas, but without the open plan needs of the engine and boiler houses, so the roofs were supported by arrays of cast iron columns leading to a distinctly church-like nave and aisle architecture. In the case of the workshop this was further emphasised by the tall mullioned windows in the north façade. Light was important in these space; the interiors are well lit by high level clerestory windows. 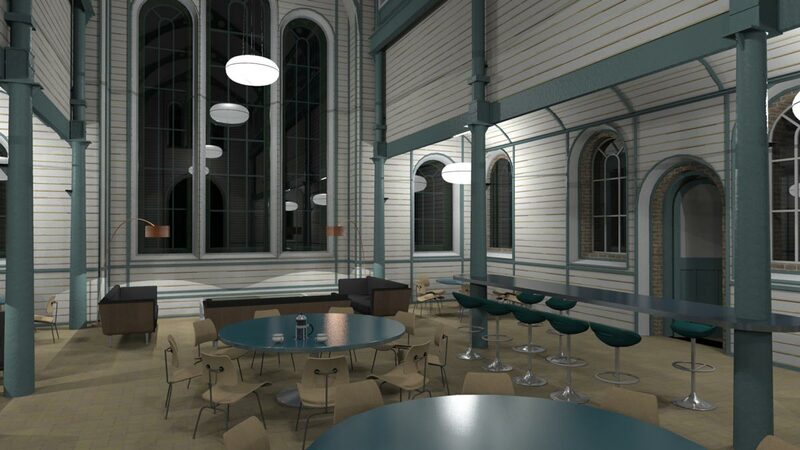 Retaining the light and pleasant ecclesiastical interior, this space will become a large, central cafeteria for use by all and will play an essential role in fostering a community. Timber surfaces will offer a relaxing contrast to the brick, steel and glass elsewhere. Once a large coal store, it links to and matches the Smithy’s facade, such that a pair of matching gabled entrances are linked by an arcade containing five large arches. A laboratory area will be formed behind the five-arched façade, with new large, dark tinted, floor level glazed panels set well back behind the arched openings, suggesting cavernous voids. Above the laboratory, within the clerestory window range will be a large office level. 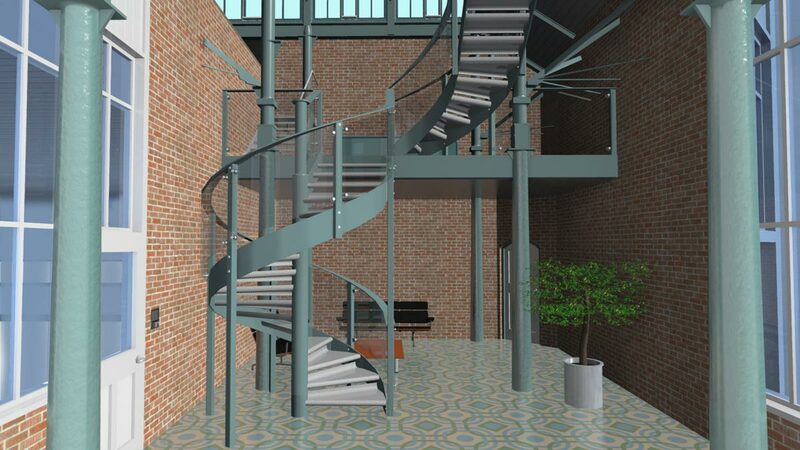 The full height entrance lobby to both laboratory and offices will demonstrate the interior scale. This engine house is the largest and tallest building on the site, with huge windows on all sides and a two storey vaulted basement below. The old engines were positioned half above ground level and half below. Some of these old floor apertures will be reopened and glazed to once again link the spaces. The building will contain three office levels within a glass and steel construction, set well back from three sides of the space, to retain the sense of enormity. 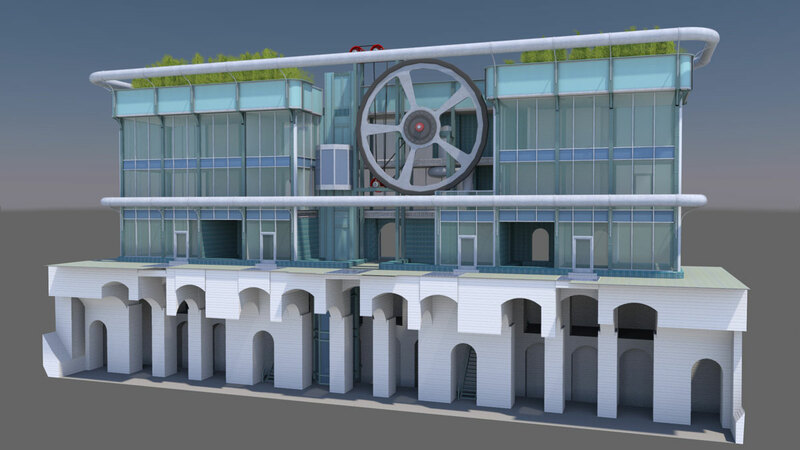 At the heart of the design is a large wheel, linked to an exposed glass elevator system. 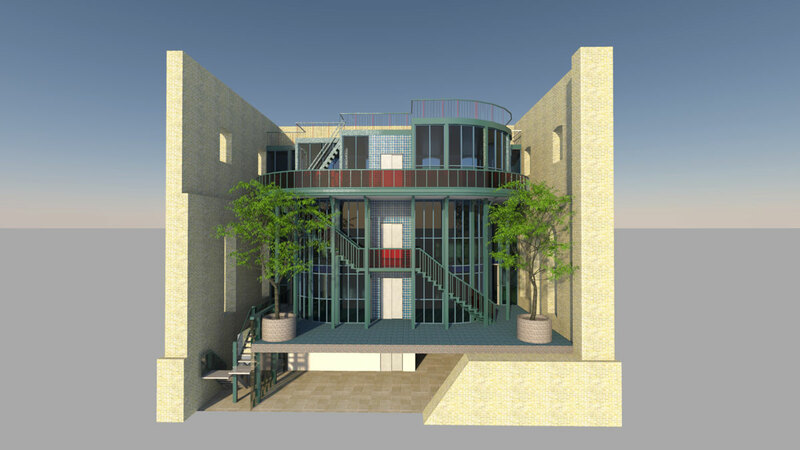 Above the offices, the fourth storey is a roof garden area for meetings, coffee breaks or a place to work. The huge engine house is accessed via the Riverdale Boiler House, through a vaulted corridor which bisects the building. On the well-lit, east side, a large office with an open mezzanine is formed and on the other side, a large plant room. General improvements to the surrounding site form a significant proportion of this project’s works. 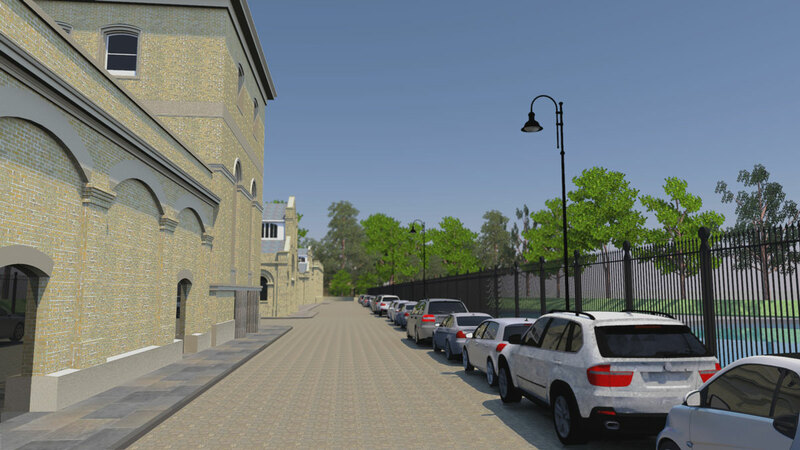 The narrow southern access road will be widened, new pavements introduced, and paver-finished hard-standings formed to create 51 every day car parking bays and a visitors car park. This new road will be bounded by new railings and lighting. In addition, a large bicycle shelter is provided, along with on-site showers and changing rooms. Charge points are included for electric vehicles. Below ground the site is re-serviced with reconstructed drainage and new HV/LV electricity supplies, fibre optic communications supplies, new water supplies and an extensive geothermal heating/cooling ground source system. There is just one entrance onto the site from Lower Sunbury Road through a newly built gate house. Access beyond the western visitors car park for vehicles will be controlled by barriers. The site will be protected by motion sensors, CCTV and electronic locking systems.